In our town, the Art Community hosted an Art Studio Tour this past Saturday. I was invited to share my Journey and Fun Stampers Journey product. I designed this little card to showcase the many different products that Fun Stampers has and how easy they are to use for beginners and experienced Stampers alike. Rubbed with Pan Pastel- green oxide Kiwi Slice over the raised portion of the card stock. Stamped on Whip Cream Card Stock with Limeade splash ink using the Pot O’Gold Stamp Set SS-0214 the Shamrock image and Die Cut using the Pot O’Gold Die Set DI-0116 using the corresponding image. Stamped the sentiment with Black Licorace Ink again using the Pot O’ Gold Stamp Set and fussy cut around this image. Using the picture for reference place the images on the card base Using the Journey Foam Square adhesives AD-0084 or AD-0085 and place one Gold Staple below the Good luck image using the Journey Days Stapler TO-0118. 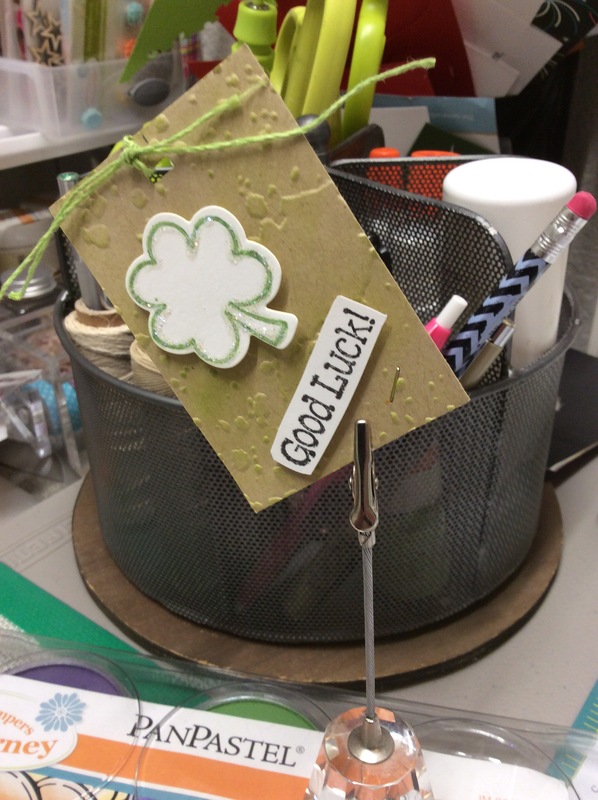 Finish the Artist Trading Card (ATC) by tying a piece of Lemon Grass Twine in the hole punched at the top into a pretty bow. Draw with Journey Glaze, AD-0002 on the inked image of the Shamrock and sprinkle with Journey Sparkle Dust AC-0013. Let dry .